Archive for the ‘Valentine’s’ Category. 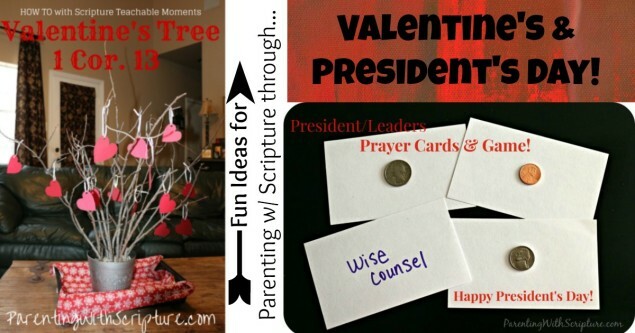 Want fun ideas for parenting with Scripture through Valentine’s & President’s Day? CLICK HERE & SCROLL DOWN through multiple Valentine’s ideas. CLICK HERE for a President’s Day idea. I’m also pleased to share that I am a contributor for a fabulous new website called ChristianParenting.org. They have advice broken down by age and by topic! I encourage you to take a look around this wonderful resource. Valentine’s 1 Cor. 13 Love Tree: Craft + Decoration = Teachable Moments! 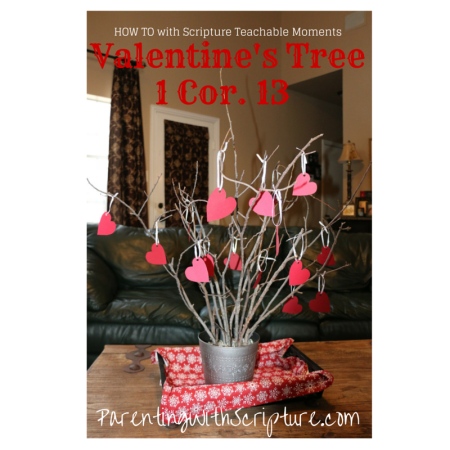 Here’s a fun and easy Valentine’s idea that can be nice decoration AND provide meaningful, parenting with Scripture style, teachable moments throughout the month of February! *Gather several bare branches and put them in a pitcher or vase. *Cut out 16 hearts big enough to write a few words on. *Punch holes in the tops of one of the sides. *Use any type of ribbon or string to tie loops on them for hanging. *Go ahead and hang all 16 hearts on the tree. *Each day, create teachable moment at your family meal time or family devotional time. *Discuss it. Parenting with Scripture: A Topical Guide for Teachable Moments is a good resource to help you with the discussion. Look up applicable topics and see the “Discussion” portion. *Each day, ask your child who God wants her to be kind to. *Write that name on the heart. *Discuss ways your child can be kind and loving toward that person. *Each day, ask your child a way she can show kindness. *Write that kindness attribute on the heart. *As teachable moments come up throughout the 16 days, refer back to the “ways to be kind” that are on the hearts. For more Scripturally meaningful Valentine ideas, scroll down through these past blog posts. 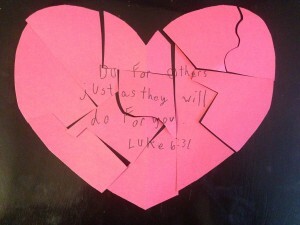 Cut a big heart out of a piece of construction paper. Option 2 – Draw and puzzle pieces (making it as easy or challenging as fits your child’s ability) and write a love verse word or entire verse inside each piece. Option 3 – Draw puzzle pieces (making it as easy or challenging as fits your child’s ability) and write a Bible reference on each section to look up. Hide the puzzle pieces and let your child find and put them together. Discuss the meaning. Add music to the hunt! 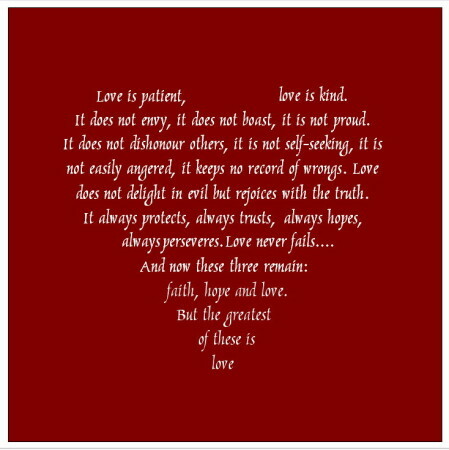 During the hunting and putting together of the puzzle, you might consider playing the following songs related to the love chapter, 1 Corinthians 13. The Gift of Love – Plan ahead for Valentine’s! Did you read last week’s post and have good intentions, but then didn’t do anything? Well, here’s an idea that may jumpstart you! Forget the chocolate and flowers and give something new this year for Valentine’s. Ummm…actually, chocolate would still be good. But seriously, what about giving the gift of love through memorizing and reciting a verse or verses about love for a loved one? This is something the kids could do for grandparents, a spouse could do for his/her beloved, families could learn together for each other, etc. The entire chapter is below and I’ve bolded the most commonly quoted sections (verses 4-8a and 13). 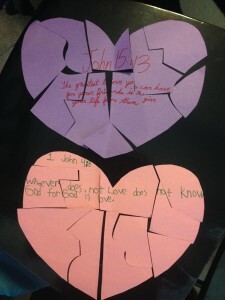 Children of any age could make or help decorate a cut-out heart or card with the verse(s) on it to serve as a memory reminder and/or part of the gift. 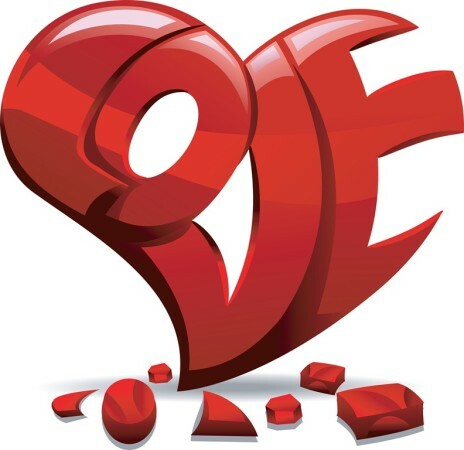 Older children or teens might enjoy making their own version of the words in heart form, as seen below. Above is a sample of the type of “Take Action” ideas in Parenting with Scripture, paraphrased from the topic, Love. But where there are prophecies, they will cease; where there are tongues, they will be stilled; where there is knowledge, it will pass away. For we know in part and we prophesy in part, but when completeness comes, what is in part disappears. When I was a child, I talked like a child, I thought like a child, I reasoned like a child. When I became a man, I put the ways of childhood behind me. For now we see only a reflection as in a mirror; then we shall see face to face. Now I know in part; then I shall know fully, even as I am fully known. 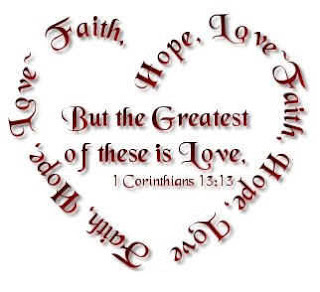 See how many verses you can think of that have to do with love. Tip: If your children are little or your family is not familiar enough with God’s Word to think of these verses from memory, write the verses below on paper hearts. Put them in a bag, pass the bag around, and let each family member pick a heart and share the verse as the bag goes around the table. Is love a noun or a verb? Hint: Consider 1 John 4:19 and John 3:16. What are some ways you can show love? Infinite ways. If your child(ren) needs prompting for ideas, ask him to think about ways at home, ways with friends, etc. Parents, be share ways applicable to your lives too and remind your child(ren) that God’s word is for ALL ages…we never outgrow it! Can you think of any Bible stories that have to do with showing love? – Each family member could pick a way to show love the next day and then share it at dinner that day. 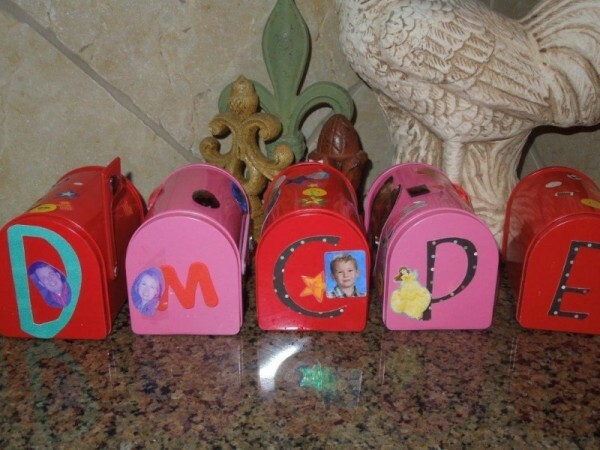 – Child could add a favorite “Love” Scripture to a Valentine’s craft to give to someone he loves. – Child could add a favorite verse to Valentine cards for friends. – Family or child could memorize a “Love” Scripture together for Valentine’s week. Child could write and/or decorate the verse to hang on the fridge as a reminder. *More verses, discussion questions, and Take Action ideas under the topic of Love in Parenting with Scripture: A Topical Guide for Teachable Moments. Love this idea from my ever creative friend, Elizabeth!